Sun., Feb. 10, 2019, 6 a.m.
STEVENSVILLE, MONT. – As video classes go, it’s hard to beat a studio with a view of the snowcapped Bitterroot Mountains and an eagle trap out the window. Dent and partner Allie DePuy own Inspired Classrooms, a video-conferencing service that connects students all over the country with wildlife biologists live on scene. This week they were preparing to link a class in Hoboken, New Jersey, with a presentation on golden eagle migration featuring members of Raptor View Research Institute and MPG. 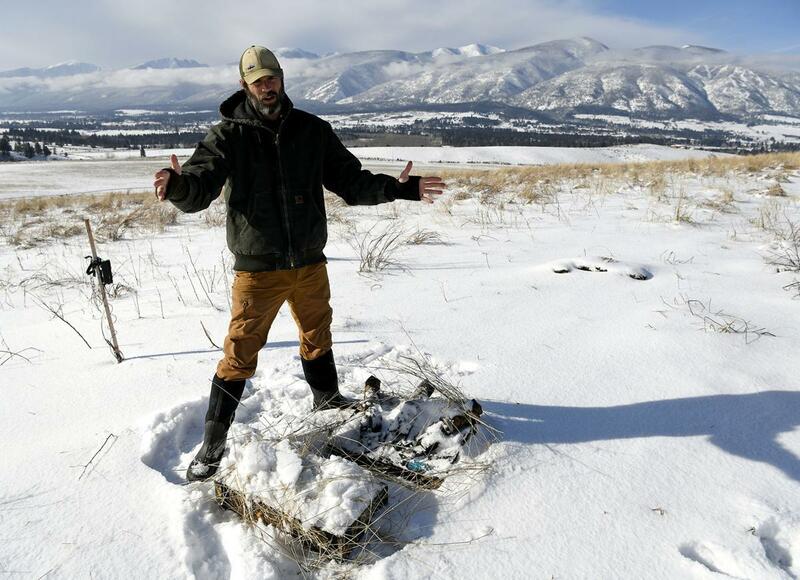 In a few days they’ll set up another studio with Montana Fish, Wildlife & Parks biologists, endangered species advocates and private ranchers for a session on grizzly bear management. Raptor View eagle expert Adam Shreading was getting ready for what he admitted was his first rodeo in the video teaching arena. He quipped that having such an interactive learning tool might have saved him some trouble in school years ago. The camera was barely bigger than a pop can, sitting on top of a bathroom trash bin which was taped to a cardboard box for proper height positioning. DePuy joked it was evidence of start-up culture in the education industry. Since Inspired Classrooms started six years ago, its technological requirements have evolved and contracted. The first cameras Dent acquired could use a green-screen function to project an outdoor background inside the studio – a feature that’s been dropped as the camera industry concentrated more on business video-conferencing. She’s had to scrounge for adapters that allow green-screen effects on the new gear. But her clients – the teachers and their classrooms – have become simpler. Where once they needed special school studios to hold up their end of the video link, now any teacher with a reasonably recent desktop computer can make the connection. Bandwidth problems have practically disappeared. The productions come in the form of “challenges” that include videos of biologists at work in the field, live presentations with props and equipment, and chances for the students to interview or question the experts. For the FWP grizzly challenge, bear manager Wesley Sarmento, Sweet Grass rancher Trina Bradley, and representatives from Vital Ground, the Rocky Mountain Elk Foundation and Salish-Kootenai Tribal Wildlife Department will all be linked into a presentation. The grizzly challenge gets aimed at Montana schools. Inspired Classrooms, however, works nationwide. It has set up studios in Puget Sound to teach about orcas. On one multistate link the students started bringing the critters. DePuy and Dent don’t do the teaching, although they often coach the biologists and other presenters on how to interact over video. At times, that means making space for the kids to get their questions in or trimming down the thickets of technical jargon. It also means giving the students exposure to the kinds of jobs and opportunities available in the outside world. Published: Feb. 10, 2019, 6 a.m.